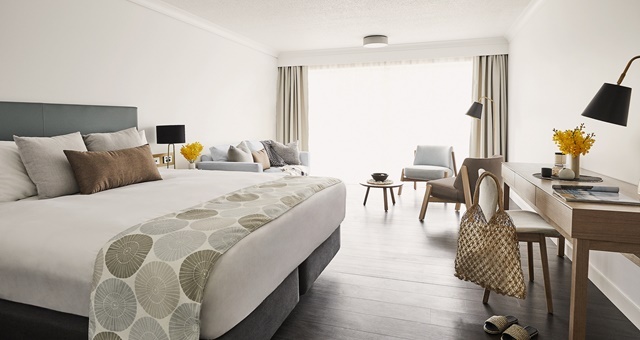 A Superior King at the new-look Daydream Island. Guests are spending their first nights on Daydream Island in over two years after the resort reopened its doors following a major $100 million redevelopment. Architecture work on the new resort was completed by Hunt Design and reflects the heritage of the classic Queenslander style housing through colonial shutters and the nature of the outdoors via a green wall and al fresco dining areas. Highlights of the new-look resort include the Living Reef, a new coral lagoon spanning 200 metres around the resort, which is home to marine fish, coral, sting rays and sharks. The reef and its educational features are led by Marine Biologist Johnny Gaskell and his team of scientists, who will lead guests on tours of the reef as well as conduct educational seminars on conservation. A new underwater observatory allows guests to observe marine life four metres below the surface. 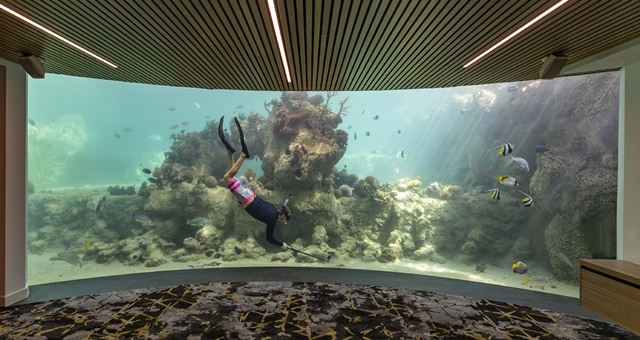 Daydream Island’s new Underwater Observatory allows guests to admire the resort’s Living Reef. Daydream Island offers 227 rooms with views of either the resort’s gardens, swimming pool or the ocean. Room design incorporates a turquoise colour scheme along with wood, stone and marble surfaces. Three new restaurants have been fired up under the watch of Executive Chef Keith Le Fevre and F&B Manager, Adrian Tyler. Infinity and Inkstone Kitchen both focus on seasonal ingredients in respective Asian fusion and modern Australian menus, while speciality gin bar Tonic overlooks the Living Reef. Daydream Island General Manager, Dawson Tang, said he was excited to be able to finally welcome guests after a long period of rebuilding.